This article is about the drug classification. For the scuba diving reference, see Nitrogen narcosis. For the sedative agent, see Sedative. For pain control medications of both narcotic and non-narcotic varieties, see Analgesic. For other uses, see Narcotic (disambiguation). The term narcotic (/nɑːrˈkɒtɪk/, from ancient Greek ναρκῶ narkō, "to make numb") originally referred medically to any psychoactive compound with sleep-inducing properties. In the United States, it has since become associated with opiates and opioids, commonly morphine and heroin, as well as derivatives of many of the compounds found within raw opium latex. The primary three are morphine, codeine, and thebaine (while thebaine itself is only very mildly psychoactive, it is a crucial precursor in the vast majority of semi-synthetic opioids, such as oxycodone). Legally speaking, the term "narcotic" is imprecisely defined and typically has negative connotations. When used in a legal context in the U.S., a narcotic drug is one that is totally prohibited, such as heroin, or one that is used in violation of governmental regulation. In the medical community, the term is more precisely defined and generally does not carry the same negative connotations. Statutory classification of a drug as a narcotic often increases the penalties for violation of drug control statutes. For example, although federal law classifies both cocaine and amphetamines as "Schedule II" drugs, the penalty for possession of cocaine is greater than the penalty for possession of amphetamines because cocaine, unlike amphetamines, is classified as a narcotic. The adoption of this Convention is regarded as a milestone in the history of international drug ban. The Single Convention codified all existing multilateral treaties on drug control and extended the existing control systems to include the cultivation of plants that were grown as the raw material of narcotic drugs. The principal objectives of the Convention are to limit the possession, use, trade, distribution, import, export, manufacture and production of drugs exclusively to medical and scientific purposes, and to address drug trafficking through international cooperation to deter and discourage drug traffickers. The Convention also established the International Narcotics Control Board, merging the Permanent Central Board and the Drug Supervisory Board. The Convention divides drugs into four groups, or schedules, in order to enforce a greater or lesser degree of control for the various substances and compounds. Opium smoking and eating, coca leaf chewing, cannabis resin smoking and the non-medical use of cannabis are prohibited. The 1972 Protocol to this Convention calls for increased efforts to prevent illicit production of, traffic in and use of narcotics as defined by the Convention, while highlighting the need to provide treatment and rehabilitation services to drug abusers. This document contains the current list of narcotic drugs under international control and additional information to assist governments in filling in the International Narcotics Control Board questionnaires related to narcotic drugs, namely, form A, form B and form C.
In medicine, a chemical agent that induces stupor, coma, or insensibility to pain (also called narcotic analgesic). In the context of international drug control, “narcotic drug” means any drug defined as such under the 1961 Convention. In order to avoid room for difference in interpretation, lawmakers (codificators) sometimes deviate from etymological (definiendum plus definientia) definitions. In doing so, they approach the term from the law enforcement point of view. The best example is the definition of narcotics in the United Nations Conventions. Narcotics are substances and preparations that induce drowsiness, sleep, stupor, insensibility, etc., and that these effects (and their rate) are complicated to prove, e.g. during litigation. Thus, the legal definition of a narcotic is whether or not it is listed on the Schedules of the Convention. If it is on some of the Schedules, it is narcotic. The term usually refers to opiates or opioids, which are called narcotic analgesics. In common parlance and legal usage, it is often used imprecisely to mean illicit drugs, irrespective of their pharmacology. For example, narcotics control legislation in Canada, USA, and certain other countries includes cocaine and cannabis as well as opioids (see also conventions, international drug). Because of this variation in usage, the term is best replaced by one with a more specific meaning (e.g. opioid). (i) Opium, opiates, derivatives of opium and opiates, including their isomers, esters, ethers, salts, and salts of isomers, esters, and ethers whenever the existence of such isomers, esters, ethers and salts is possible within the specific chemical designation. Such term does not include the isoquinoline alkaloids of opium. (ii) Poppy straw and concentrate of poppy straw. (iii) Coca leaves, except coca leaves and extracts of coca leaves from which cocaine, ecgonine and derivatives of ecgonine or their salts have been removed. (iv) Cocaine, its salts, optical and geometric isomers, and salts of isomers. (v) Ecgonine, its derivatives, their salts, isomers and salts of isomers. (vi) Any compound, mixture, or preparation which contains any quantity of any of the substances referred to in paragraphs (b)(31)(i) through (v) of this section. A 1984 amendment to 21 USC (Controlled Substances Act), Section 802 expanded and revised definition of "narcotic drug", including within term poppy straw, cocaine, and ecgonine. United States Court of Appeals, Eighth Circuit. Decided Oct. 31, 1979. LAY, Circuit Judge. John Arthur Stieren appeals from the judgment of conviction for possession of cocaine with intent to distribute and dispense under 21 U.S.C. § 841(a)(1). Stieren contends that the statute is unconstitutional because "cocaine is classified as a narcotic under Schedule II of 21 U.S.C. § 812(c), when as a matter of scientific and medical fact cocaine is not a narcotic but is a non-narcotic stimulant." The sufficiency of the evidence is not disputed. Stieren was convicted after special agents testified that he was in possession of and attempted to sell them a large quantity of cocaine. Defendant urges that the testimony and reports by physicians and scientists demonstrate that cocaine is not a narcotic. He also cites cases which hold that cocaine is not a narcotic under the pharmacological definition of the term. State v. Erickson, 574 P.2d 1 (Alaska 1978). It is within the legislative prerogative to classify cocaine, which is a non-narcotic central nervous system stimulant, as a narcotic for penalty and regulatory purposes. 21 U.S.C. § 802(16)(A). The use of cocaine poses serious problems for the community and has a high potential for abuse. Congress' choice of penalty reflects a societal policy which must be adhered to by the courts.2 Congress has the power to reclassify cocaine. This power has been delegated to the Attorney General. 21 U.S.C. § 811(a)(1). If cocaine is to be reclassified, defendant's arguments should be made to the legislative branch, not the courts. We hold that Congress had a rational legislative purpose when it classified cocaine as a Schedule II narcotic drug for the purpose of imposing penalties. The term "narcotic" is believed to have been coined by the Greek physician Galen to refer to agents that numb or deaden, causing loss of feeling or paralysis. It is based on the Greek word ναρκωσις (narcosis), the term used by Hippocrates for the process of numbing or the numbed state. Galen listed mandrake root, altercus (eclata),[not in citation given] seeds, and poppy juice (opium) as the chief examples. It originally referred to any substance that relieved pain, dulled the senses, or induced sleep. Now, the term is used in a number of ways. Some people define narcotics as substances that bind at opioid receptors (cellular membrane proteins activated by substances like heroin or morphine) while others refer to any illicit substance as a narcotic. From a U.S. legal perspective, narcotics refer to opium, opium derivatives, and their semi-synthetic substitutes, though in U.S. law, due to its numbing properties, cocaine is also considered a narcotic. 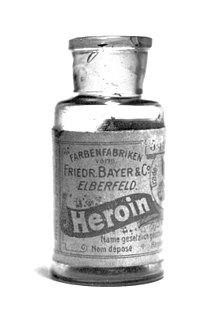 Sense of "any illegal drug" first recorded 1926, Amer.Eng. The adj. is first attested c.1600. There are many different types of narcotics. The two most common forms of narcotic drugs are morphine and codeine. Both are synthesized from opium for medicinal use. The most commonly used drug for recreational purposes created from opium is heroin. Synthesized drugs created with an opium base for use in pain management are fentanyl, oxycodone, tramadol, demarol, hydrocodone, methadone, and hydromorphone. New forms of pain medication are being created regularly. The newest drug to come out in 2014 is zohydro, an intense dosage of hydrocodone medication, the strongest yet created for pain management. Analgesics are drugs that relieve pain. There are two main types: non-narcotic analgesics for mild pain, and narcotic analgesics for severe pain. ^ Julien, Robert M. A Primer of Drug Action. 11th edition. Claire D. Advokat, Joseph E. Comaty, eds. New York: Worth Publishers: 2008. page 537. ^ Mangione MP, Matoka M: Improving Pain Management Communication. How Patients Understand the terms "Opioid" and "Narcotic." Journal of General Internal Medicine 2008; vol 23:9 1336–1338. ^ Carl B. Schultz (1983). "NOTE AND COMMENT: Statutory Classification of Cocaine as a Narcotic: An Illogical Anachronism and in colombia this are more the narcotic and the drus". 9 Am. J. L. and Med. 225. ^ Convention 1961 Archived 2009-05-20 at the Wayback Machine. Incb.org. Retrieved on 2011-09-24. ^ Illicit Drugs – Drug Definitions. UNODC. Retrieved on 2011-09-24. ^ TERMINOLOGY AND INFORMATION ON DRUGS. (PDF) . Second edition. United Nations Office on Drugs and Crime. 2003. Retrieved on 2011-09-24. ^ PRELIMINARY DRAFT SURVEY ON NATIONAL LEGISLATION ON "COUNTERFEIT MEDICINES". (PDF) . World Health Organization. 4 May 2010. Retrieved on 2011-09-24. ^ WHO | Lexicon of alcohol and drug terms published by the World Health Organization. Who.int (2010-12-09). Retrieved on 2011-09-24. ^ 608 F.2d 1135. Bulk.resource.org. Retrieved on 2011-09-24. ^ J. Richard Stracke (1974). The Laud Herbal Glossary. Rodopi. ^ Francis Edmund Anstie (1865). Stimulants and Narcotics: their mutual relations. ^ "De Furore, cap VI" (in Latin). ^ Julien, Robert M. See A Primer of Drug Action full citation above. ^ Narcotics Drug Addiction Help Rehabilitation Recovery Resource. Drug-rehab-referral.org. Retrieved on 2011-09-24. ^ Online Etymology Dictionary. Etymonline.com. Retrieved on 2011-09-24. ^ "List of Narcotic Drugs – Illegal and Prescription Narcotics Drugs Effects". Retrieved 18 March 2017. ^ General Drug Categories. Fda.gov (2009-08-11). Retrieved on 2011-09-24. Look up narcotic in Wiktionary, the free dictionary. List of controlled substances, some of which are classified as "narcotics", in the U.S. Controlled Substances Act (CSA). Not all of the classified ones are chemically narcotic, as described on the top of this page.